One last of the First Impression posts for now! While I was at Sephora I also swatched the four Kat Von D Shade Shifter eyeshadow singles. 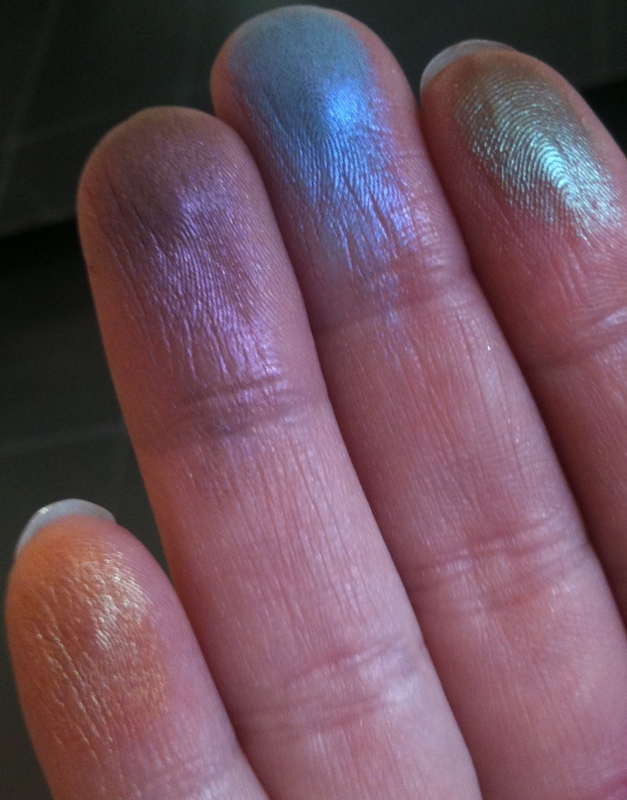 This are duochrome shades and from my swatching I could tell they were really quite pigmented. Plus they were quite large- it would take dedicated use to ever run out of one of these! The four shades are On the Road (reddened brown with green reflect), Love Letter (deep purple with red reflect), Stockholm (Cornflower blue with violet reflect), and Devotion (Copper with gold reflect). On the road was the most intense of the shades and Love Letter was the least obvious of the duochromes. 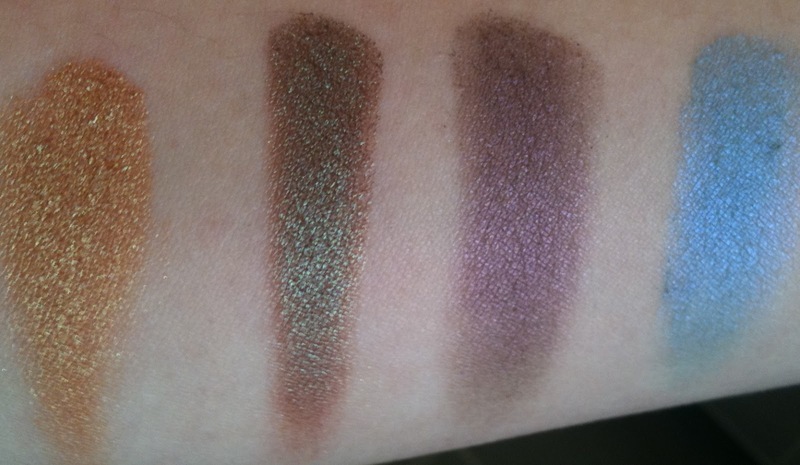 I couldn't get Stockholm to show how lovely it was (my favourite of the shades) and Love Letter only showed up faintly in one of the photos. I do find Stockholm to be a creepy name when in comparison to the other shade names. Seriously put together they sound like a kidnapping attempt. *shudder* As a side note, the Sephora pictures are surprisingly accurate in their colour matching. Anyways Enjoy! Anyone have any Kat Von D eyeshadows? Do you like the brand? Pretty colors. I haven't tried Kat Von D yet, just haven't gotten around to it. I appreciate her aesthetic, though-- matches mine. I've not really tried much from her either but I agree I like her style. After swatching these I have to admit I'm intrigued to try some stuff from the line. Some awesome deals at the moment!